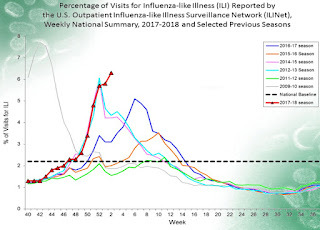 Genomics, Medicine, and Pseudoscience: The flu is getting worse, just as the government shuts down. The flu is getting worse, just as the government shuts down. The flu season is looking particularly bad this year. 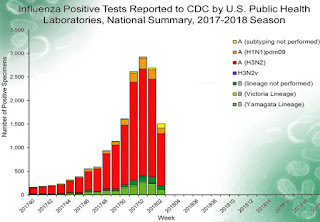 We already had signs of trouble back in November and December, when it emerged that the flu vaccine was not very effective against the dominant strain that is circulating this year, which is called H3N2. 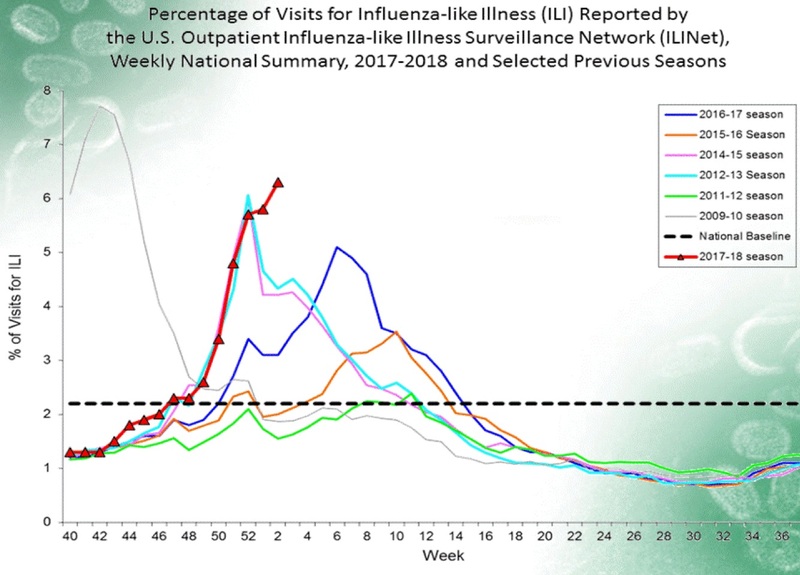 That red line spiking upward in the middle of the chart shows the number of flu-like cases reported by the CDC's national network this year. Rather than going down, the trend shows a sharp rise over the past two weeks. We don't know exactly what it is (these are not laboratory-confirmed flu cases), but more people are getting sick. Even more alarming are the reports of young, healthy people dying of the flu. This past week the Washington Post reported on a healthy 10-year-old boy who caught the flu and died within just a few days. Just before Christmas, a healthy 21-year old young man in Pennsylvania came down with the flu, and went rapidly downhill until he was rushed to the emergency room on Dec. 27. The hospital was unable to save him, and he died the next day. 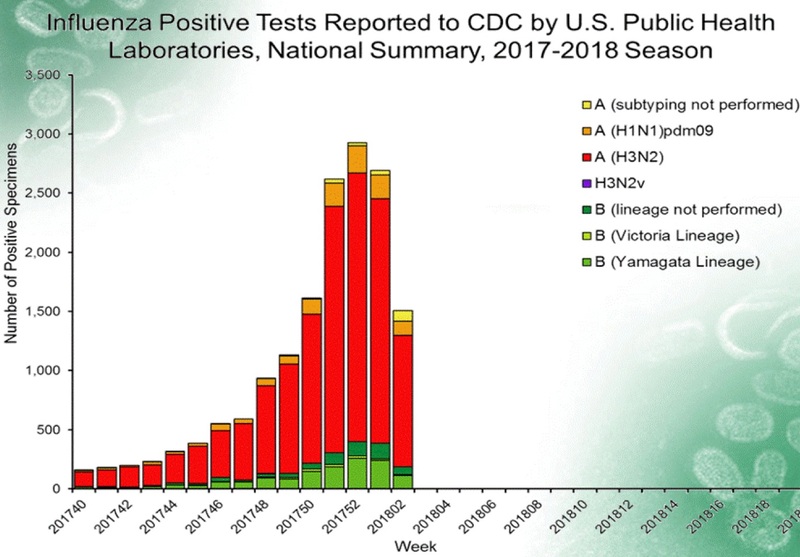 These cases are truly alarming, and even though the CDC hasn't seen a statistically significant increase in deaths among young people (not yet, at least), everyone needs to take the flu very seriously this year. With the government shut down, a difficult situation becomes worse. Most of the CDC staff will be forced to sit on their hands when they could be working–and many of them want to work, but they won't be allowed to. What's especially frustrating (and wasteful) is that the U.S. will almost certainly pay all federal employees for this forced time off, as it did in previous shutdowns. With the right technology, we should be able to produce a universal flu vaccine, one that we can take once and never need again, like most other vaccines. Scientists are getting closer to that, with much help from the (currently shut down) NIH. Oh, and one more thing: the flu shot cannot give you the flu. I only mention this because anti-vaxxers continue to promote this particular myth. 80% of people who have come down with the flu this year did not get vaccinated.